Sur.ly alters the outbound links on your site so that visitors can view external target pages without leaving your domain. It also protects and informs website users, and helps you recapture them after they follow the outbound links. Sur.ly’s best practice includes usage of a subdomain: it provides a safety buffer between your website and any external domains that are not whitelisted as your project’s link building partners. Create a custom subdomain (e.g. safe.your-site.tld). Install and activate Sur.ly plugin for your CMS; register with Sur.ly website. Log in and use Sur.ly dashboard to connect it to your subdomain. That’s all! From now on Sur.ly will work its magic for you: users that follow outbound links will get to subdomain’s intermediate pages, instead of leaving your domain right away. It helps to avoid immediate transferring users from your site to suspicious target pages (another important benefit which has to be mentioned here is search engine ranking retention). Alternatively, you may not use a subdomain but opt for Sur.ly public security gateway. How can your website visitors benefit from Sur.ly? Sur.ly can protect your website visitors from toxic content, which they might bump into after following some outbound links left by other users in comments or forum posts. Safe links: users can view a target page’s content seamlessly via iframe while staying within your domain. Sur.ly keeps the link usability untouched and additionally makes your site less prone to the visitor drop offs because of them leaving via those links. Unsafe links: if an adult or malware-infected source is detected ahead, users will be immediately warned about it (with the help of pop-up alerts), as Sur.ly maintains its own database of web reputation profiles. Awareness: users are constantly informed about safety status and reputation of every external site they reach through your outbound links (owing to Sur.ly toolbar). How does Sur.ly affect a website’s search engine ranking? Sur.ly protects your site from Google algorithmic penalty that can be imposed on it for linking to age-restricted material, malware, etc (so called ‘toxic links’ that might be accidently posted by users in comments or forum posts). Sur.ly prevents direct linking of your main project to external toxic sources and thus keeps your site legit and clean for search engine robots. In such a way, Sur.ly can neutralize efforts of myriads fake users creating rough-and-ready accounts (e.g. empty photo albums, blank profiles, etc) on public sites to get free links from them. It allows not only to sanitize outbound linking of any project, but also helps you keep the bounce rate in check - visitors can never drop off after following the outbound links, as they technically stay within your domain even while viewing and browsing external pages. How does Sur.ly retain visitors? It shows an up-to-date safety status of external websites being visited. 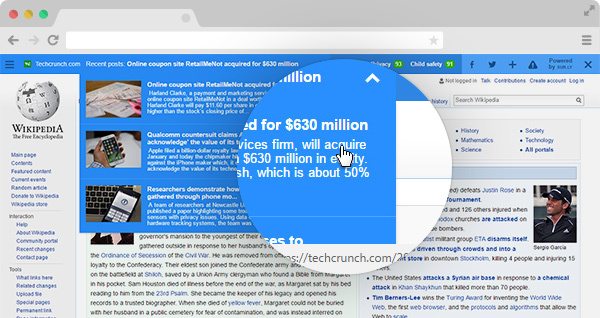 It advertises clickable headlines and pics from your articles and thus prompts users to click on them and get back to see more of your content. It can be customized to fit your website’s visual design\branding and thus promotes your business identity beyond the domain’s pages. What is user-generated content and why care about it? User-generated content includes comments, forum posts and user-created public site profiles used by website visitors to express their opinions, ask questions or share valuable information. They can appear self-promotive or harmful for a reason (spam, adult, malware, etc). They may cause sudden traffic drop-offs and contribute into losing your visitors, as every outbound link is a kind of additional exit portal for users. Sur.ly is designed to mitigate and control these risks: no links posted by users can cause problems with Google search algorithms, violate AdSense policies or put other visitors in danger. How does Sur.ly detect adult content and security threats? Sur.ly features a complex and time-tested mechanism that allows it to judge whether a site is safe with family-friendly content or not safe for a reason, such as an adult or malware-infected content. It relies upon a constantly growing database of web reputation profiles, combining various data from multiple sources, including user reports and algorithmic verdicts given by Google Safe Browsing and other services. Which content management systems are currently supported? Sur.ly provides specific plugins and addons for almost all popular content and forum management systems, including Wordpress, Drupal, Joomla, vBulletin and many more. If you’re interested in a custom integration, then you may download SDK for a programming language of your choice. Sur.ly is absolutely free for all categories of corporate or private users.